Browse our fabulous selection of hand bags and evening bags. Add that special touch to your style. 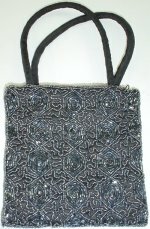 Our evening bags are hand-made using glass beads, worked delicately on both sides on satin or velvet and also have shoulder slings.